SONY Sound Forge Pro is a digital audio editing software suite which includes a comprehensive set of audio processes, tools and effects for audio manipulation. SONY Sound Forge Pro is one of the top audio editing programs, providing professional and semi-professional users with all the capabilities for audio recording, editing, effects processing, streaming content creation, forensic audio and more. - Live audio recording is easier than ever with Sony Sound Forge Pro. Just plug in a microphone or instrument into your computer’s sound card and click the Record option. The Vinyl Restoration Tool allows you to digitize vinyl LP records and tapes. You can also import audio from CDs as most poular audio formats are supported, including MP3, WMA and FLAC. - Edit and enhance your audio tracks by using the rich set of editing tools provided such as balancing sound level, trimming unwanted section and audio-video synchronizing. - Sound Forge Pro enables you to create your own karaoke tracks fast and easy thanks to the featured Vocal Eraser plug-in which can remove vocals or isolate and extract vocal tracks from songs for remixing and also contains presets for multiple genres and vocal types. - The built-in exclusive Audio enhancer plug-in contains five critical processes for enhancing audio files to broadcast-quality standards with just one mouse click and user presets including music and dialog settings. ( available only for purchased or upgrades to the latest Sound Forge Pro version). - Besides Show Me How tutorials, Sound Forge Pro includes four comprehensive videos which provide instructions for CD and podcast creation, audio mastering and vinyl restoration. - Sound Forge Pro provides optical authoring tools with multiple options allowing you to burn one track at a time or you can select disc-at-once and fully control pauses between tracks. Convert your audio files to popular formats, quick and easy. 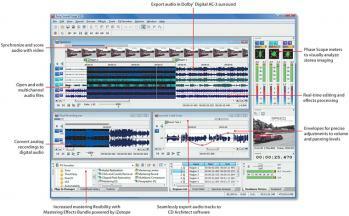 - Sound Forge Pro allows importing popular video formats including Windows Media, QuickTime and many more. - Choose from over 30 signal and effects processing plug-ins to customize your audio, including compression, EQ, delay, chorus, reverb and others. Additionally you can expand the number of effects you can apply with the VST plug-in, thus highly increasing your audio processing capabilities. - 150 MB hard-disk space for program installation. - 128 MB RAM (256 MB recommended). - 24-bit color display recommended. - CD-ROM drive (for installation from a CD only). - Supported CD-Recordable drive (for CD burning only). - Microsoft DirectX 8.0 or later. - Microsoft .NET Framework 1.1. - Internet Explorer 5.1 or later . A small GUI for wavpack.exe and wvpack.exe .